Excess salts in a plant’s root zone interferes with water uptake. Salty soils typically occur in dry areas where water evaporation exceeds rainfall. Also, plants can be over fertilized (e.g., with NPK fertilizers or manure tea) resulting in salt injury to the plants. ECHO staff have been asked at times for advice on an affordable way to get a rough idea of soil salinity. 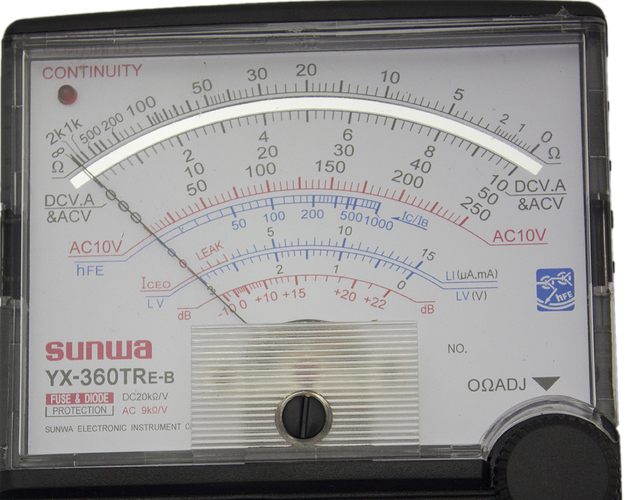 There are hand-held electrical conductivity (EC) meters that can be purchased for less than $50. These, or a more expensive laboratory bench EC meter, are excellent options. In some areas, though, they may not be as available or affordable as an ordinary ohm/volt multitester. With that in mind, a small laboratory study was set up to find out how reliably an ohm meter can measure salinity in comparison to an EC electrode on a laboratory bench meter. Morton’s Canning and Pickling Salt was added to purified (via reverse osmosis and deionization in our lab) water to obtain solutions with known salt concentrations of 0.21, 0.62, 1.99, 5.99, and 17.60 deciSeimens (dS)/m. Each of the five solutions was poured into five beakers. One measurement was taken for each beaker (for a total of 25 measurements; 5 solutions X 5 beakers) with the laboratory EC meter (Hanna Instruments-HI13512-01) and an analog ohm/volt multimeter (Sunwa YX-360TR). Prior to doing the study, we experimented with a couple of digital meters but weren’t always able to get a reading in liquid solutions. Also, the analog meters have an X10 setting, which is easy to work with when converting back and forth between resistance and conductivity units. This particular multitester cost around $15USD and has a nice, wide screen; we’ve found that with small/narrow screens the meter scale is more difficult to read. The ohm/volt multitester was set at X10 ohms, with resulting resistance (ohms) readings converted to conductivity (dS/m) units. Findings are summarized in the graph below. Notice that values obtained with the EC meter, as shown by the solid black dots, were very close to the known/prepared concentration. Even at the highest salinity concentration of 17.6 dS/m, the lab EC meter worked very well. 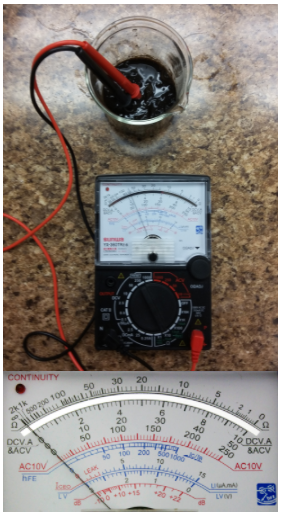 By comparison, the ohm/volt meter gave comparable readings as the EC meter, up to about 2 dS/m. 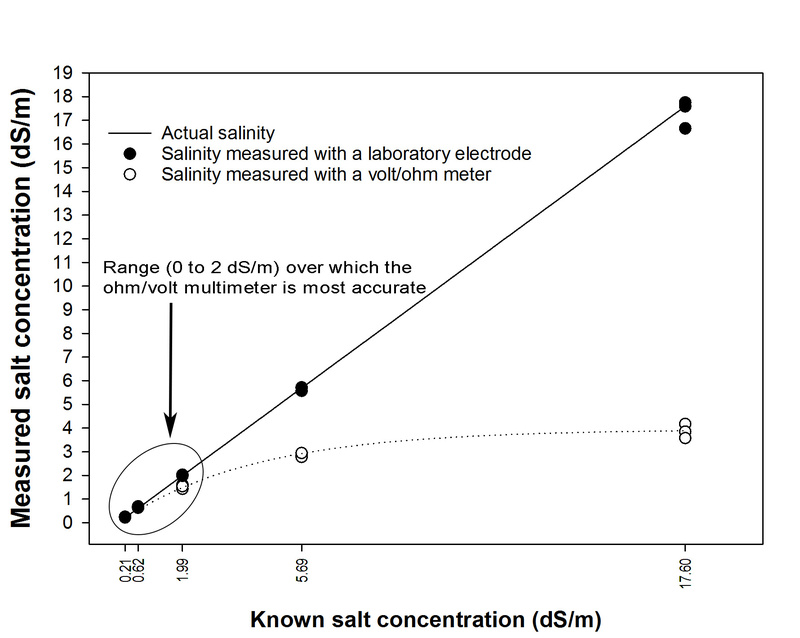 At salinity concentrations above 1.99 dS/m, the ohm/volt meter readings were significantly less than the known concentrations. 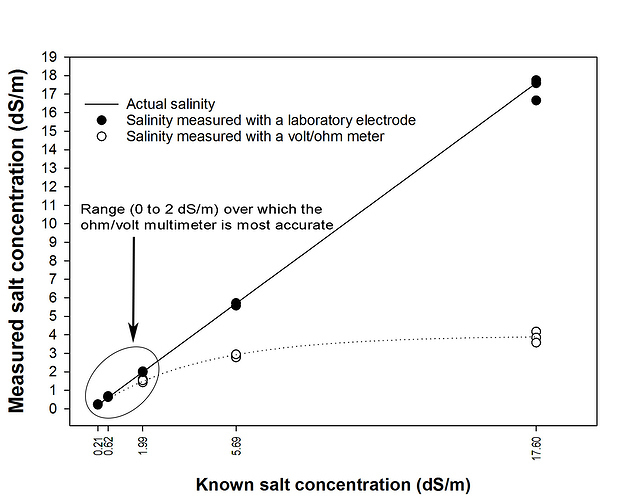 The tendency of a multimeter to underestimate salinity at higher salt concentrations has to do with the influence of direct current (used by the multimeter) versus alternating (used by the EC meter) current on the ions in solution. 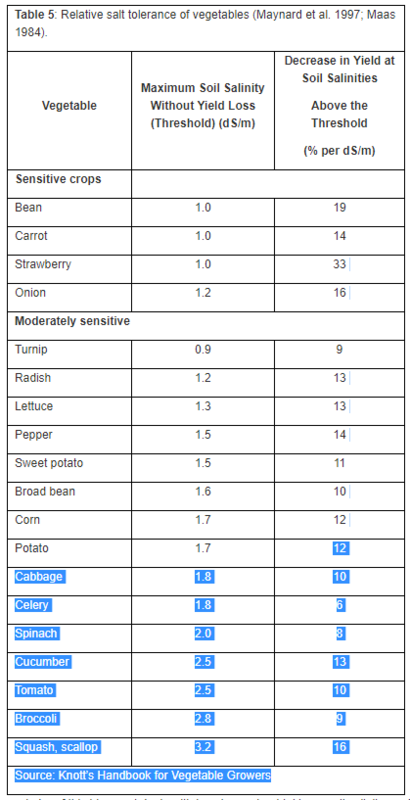 Nevertheless, results showed that a multimeter may be useful in determining whether the salinity of a soil is low or high for more salt-sensitive crops, which takes in many commonly grown vegetable (see Table 1 below). Collect some soil from around the root zone of crop plants, avoiding any crusted surface salts. Air dry your sample and place 20 g of it into a clean, non-metal container. Add salt-free (deionized or distilled water is best but rainwater is acceptable) water until you can see water shining on but not over the soil surface. It might be necessary to add a little more water after the soil has absorbed some of the first addition of water. You have created a saturated soil paste. After a short equilibration period (10 minutes should be enough), to allow soil salts to dissolve in the water, measure the soil salinity. 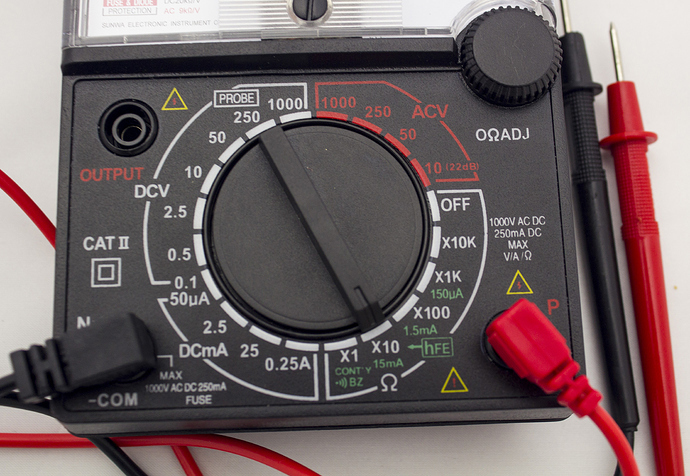 Make sure the meter has a fresh battery(s), as accuracy can suffer with a depleted battery. Also ensure that the probe lead tips are clean (no corrosion). With the meter off, ensure that the needle rests on the infinity (∞) on the left side of the scale. If it doesn’t use a flat screwdriver to turn the zero adjuster screw (shown in the photo below) to move the pointer to infinity. This adjustment should not be needed very often. Connect the probe leads to the meter by inserting the red lead into the positive socket on the meter, and the black lead into the negative (may be labeled as COM) socket. Set the multimeter on resistance, as shown by the symbol for ohms, Ω. Turn the meter dial to select “X10” ohms. 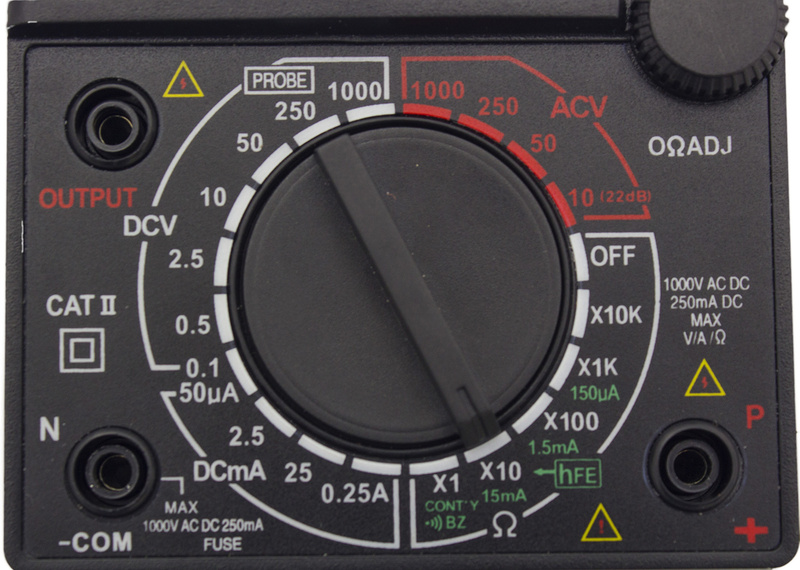 Other settings, such as X100 will result in the needle being more centered on the meter scale, but the X10 readings are more accurate—values are closer to what they should be when converting from ohms to dS/m at the end of the process. Zero the meter by touching the tips of the red and black leads together. With the lead tips touching, turn the zero control knob until the pointer rests on zero, on the right side of the scale. Take a reading by placing the probe tips, held 1 cm apart, into the saturated soil paste. Exact distance between the tips is not important, as in a saturated soil EC only minimally varies with probes up to 5 or 10 cm apart. Note the number on the ohms scale (typically located at the top of the display) indicated by the needle. 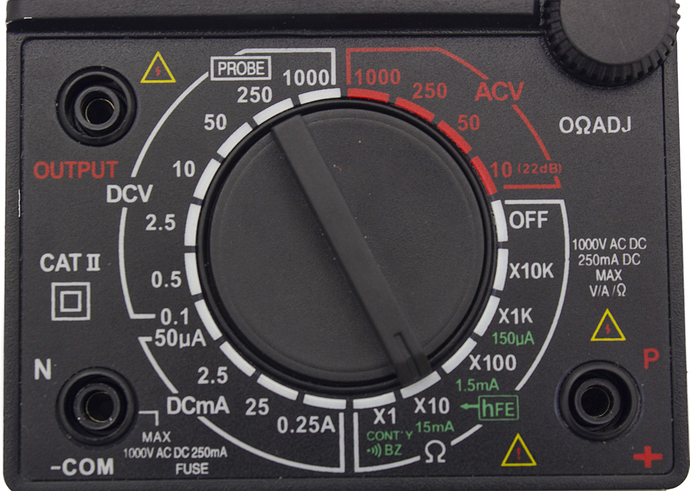 With the meter set at X10, the number of ohms indicated on the meter scale must be multiplied by 10. For instance, if at X10 the needle rests on 100 on the ohms scale, the actual number of ohms is 100 X 10 or 1000. Convert the measured resistance (ohms) reading to conductance by first calculating the inverse of ohms. Continuing the example above, the inverse of 1000 ohms is 1/1000. Thus, 1000 ohms is equivalent to 0.001 mhos. Since the leads were held 1 cm apart, an assumption is made that the measurement is actually mhos/cm. Multiply mhos/cm by 1000 to convert to dS/m. A measurement of 0.001 mhos, then, is equivalent to 0.001 X 1000 or 1 dS/m. 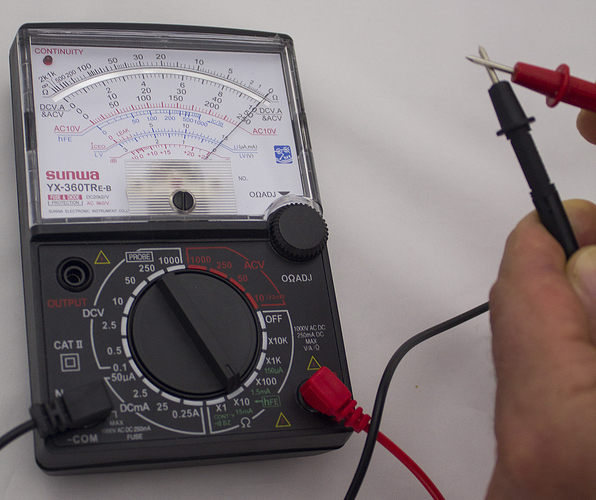 See Table 2 below for a listing of ohms increments on a multimeter, with resistance (ohms) already converted to conductivity (mhos, µS, or dS per m) units. Notice that the higher the resistance, the lower the conductivity. This means that, on an ohm/volt meter set to X10 ohms, salinity is probably very minimal if the needle rests at a resistance value of 1k (1000 ohms) or higher (towards the left, approaching infinity). 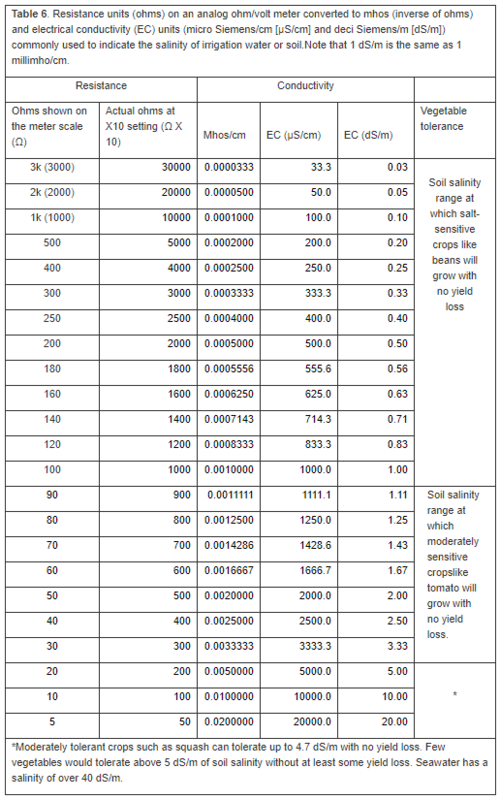 If the needle rests on an ohms value of 50 or less, salinity could be limiting the growth of some crops, especially vegetables. Thanks for sharing a wonderful information.I don’t think an ohmmeter is going to have the resolution you need. You’re talking about resistance readings that are down in the dirt. To get the accuracy and resolution at that range you would be spending thousands of dollars. For instance, you could buy one of these. The standards that are currently in use in our hobby are relatively cheap, easy to use, and reliable. Thanks for your response. I noticed that your link did not come through and we are, of course, interested in any low-cost and reliable testing tools that might be available. Could you provide the link again, (and let me know if it was a technical issue that prevented you from inserting it before)? As you mentioned, high accuracy and high resolution tools can be very cost-prohibitive and therefore may not be appropriate for many in our field.